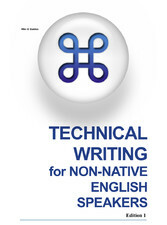 Technical Writing for Non-Native English Speakers. El año pasado compartía este descubrimiento con los suscriptores de la lista de distribución de proTECT (http://www.rediris.es/list/info/protect.html). The goal of Technical Writing for Non-Native English Speakers is to provide a framework for ESL authors to write professional documentation. This guide helps authors to write consistent documentation, so that technicals and users can expect and trust certain structures and conventions in professional manuals and documents. This style guide (la negrita es mía) discusses the basic principles of clear, concise writing so that users can achieve the maximum benefit from corporate technical documentation. The guide also provides standards for common terms and concepts. Try to keep in mind that this guide, in many cases, provides recommendations rather than absolute rules. Where there are multiple methods to accomplish various goals, your responsibility is to follow this guide so that your manuals will be consistent from topic to topic, manual to manual and product series to product series. Please remember that in all phases of product development, from system design to documentation, consistency is a virtue. When you write technical documentation, try to follow these guidelines as closely as possible. Users will benefit from consistent application of the guidelines in this guide. This style guide is primarily for ESL and non-native English authors compiling documentation in English. Although you can apply many of the guidelines in this book to other languages, some guidelines are specifically for English-language usage only. Si alguno de vosotros se decide a leerlo todos os agradeceremos vuestras críticas constructivas ;-). Espero que todos os resulten interesantes y os deseo una buena lectura :-).